My German "mom" sent me these six postcards along with her annual Christmas letter. 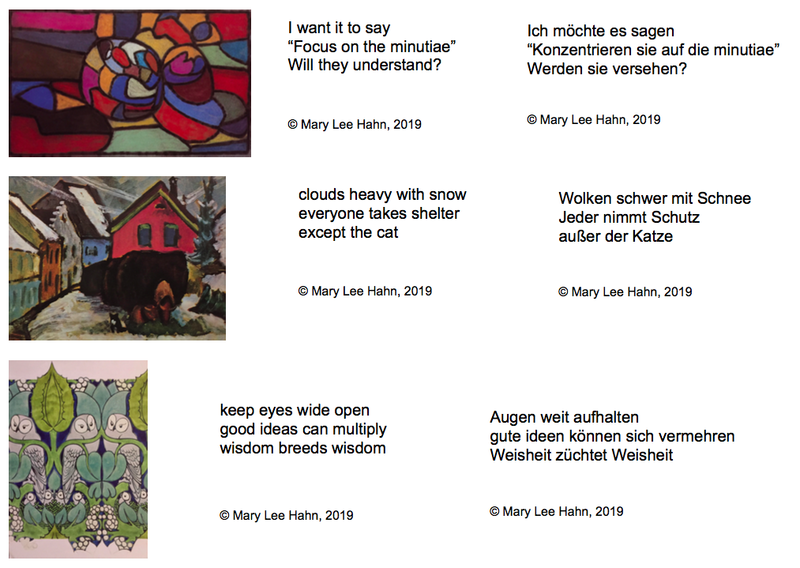 Last Sunday, on the brink of the mid-month "deadline" for sending postcards in Jone's (Check it Out / Deowriter) New Year Post Card Exchange, I enjoyed hours of glorious FLOW as I forgot about/ignored all the schoolwork and housework and wrote these ekphrastic haiku. I translated them into German (thank you, Google Translate!) and organized them in Google Draw so I could print off the whole lot and send them to Elisabeth so she could see how her gift to me has kept on giving. Elisabeth's daughter Gabriele (who is just a bit older than me) told me when we visited last summer for Elisabeth's 90th birthday, that she (Elisabeth) writes haiku. I can't wait to hear what she thinks of mine! Tricia at The Miss Rumphius Effect has this week's Poetry Friday roundup. Yay for being in the zone! Happy (almost) weekend! I hope Elisabeth responds with a haiku! I love "hush of waves." 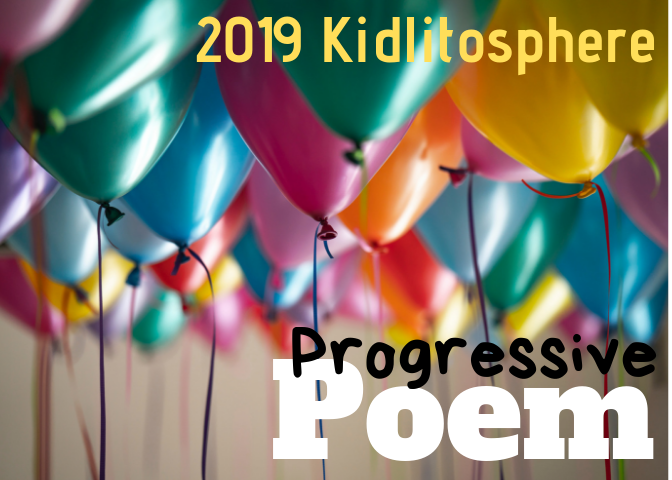 Elisabeth will love your haiku -- ekphrastic poetry is such fun. I especially like the humility of the little hut :). 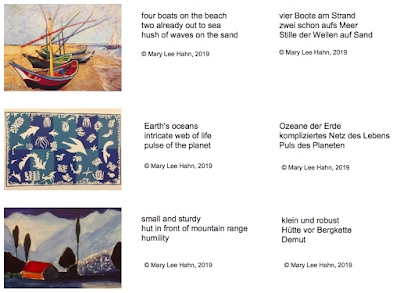 The cards and words are lovely, Mary Lee. I love that one about the cat, and I love the backstory, too, special back and forth love! Oooh, these are just gorgeous. I love how much German and Dutch are cousins - I think I'll find German easier after studying Dutch; so many words overlap! So wonderful! Thanks for sharing. I'm feeling like an idiot for missing the sign up for this exchange. I'm glad others are posting so I get to enjoy them anyway. What a delight, Mary Lee. Such a treat for Elisabeth. My favorite is the last, "keep eyes wide open etc." but I do love them all. AND jealous about you being in the FLOW. I write to experience that flow. Elusive as it can be sometimes. But worth the search. Each one of these is a gem, Mary Lee - glad you set aside mundane tasks to focus on creating these! 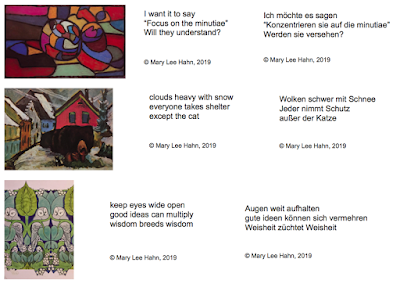 I love seeing all of your ekphrastic haiku together with the inspiring art. I especially appreciate the one gracing my refrigerator! I also enjoyed the German versions since once upon a time I was a German major. Your owl postcard with "wisdom breeds wisdom" haiku is precious-the fanciful owls add such a magical flavor to your haiku, thanks Mary Lee! 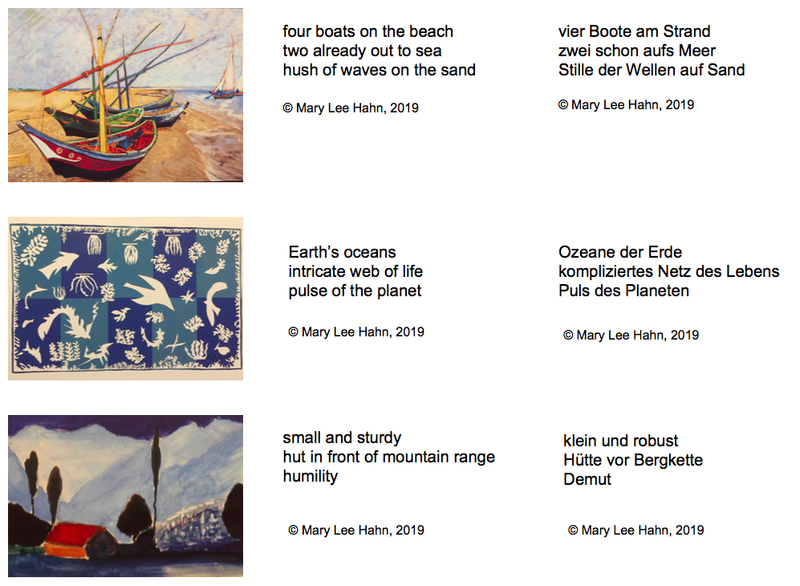 These are all wonderful, Mary Lee. I don't think I can choose a favorite. Those owls! That cat! "Pulse of the planet." Your German "mom" will love them, too! These stories that you share make my heart burst and also realize the gift writing can be to others/friends. These are incredible! I am really digging the German translation. 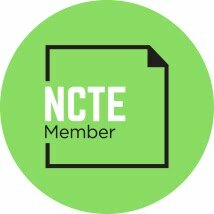 That's really neat! Your "Will they understand" haiku made me smile. I often ask myself this question when writing. These are all just wonderful! I enjoyed the story behind them, too. I love when art begets art begets giving and on and on. Who knows where it will end? Isn't it wonderful when you can be totally immersed in the craft you love so dearly. I think your project was one that has all the bells and whistles, even the translations. May I capture the snow haiku for Winter's Embrace Gallery? What a wonderful return you have made on the original gift. What a lovely connection between you and your German 'mom'. I think my favourite is that line 'except the cat'. Oh, how wonderful! I especially love the boats. That painting has always made me happy. So glad you had some time to immerse in words. It's the best, isn't it? Kudos for the German translation! I've never been so brave as to try to translate. You inspire.